On very short notice, Fox gave National Greyhound Adoption Program a small window to talk about the new dogs that have just arrived from Daytona Beach, FL. If you didn't already know, 30 greyhounds recently arrived and are available for adoption. Their pictures are available on our website. NGAP dogs, Booboo, here for his cancer treatment, Queenie and Bambi joined David Wolf for this special TV appearance. 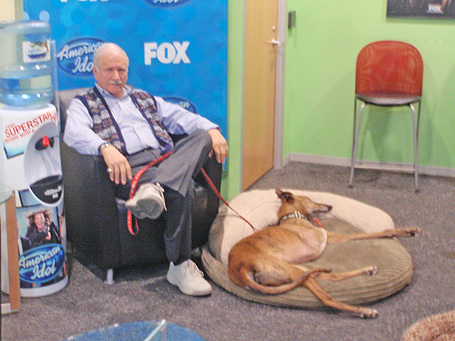 Above: NGAP Director, David Wolf, relaxing in the greenroom with Booboo.